It is easy to see why we named our winery Blue Sky. 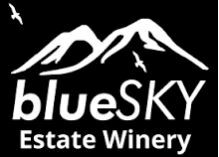 Blue Sky Estate Winery is situated on an ideal bench overlooking Osoyoos Lake. Beautiful lake and mountain views sit just beyond our vines. Look up and see our namesake, the stunning South Okanagan Sky, which blesses us with the needed sunlight for our grape vines to grow. Tasting room and wine shop is currently open daily from 11am – 5pm.